If your Thanksgiving company includes eaters of mixed persuasions, vegetarians and vegan guests won’t want to eat stuffing that’s been cooked in the bird. Of course, you need not wait for special occasions to make this. Everyone loves stuffing! Of course, you can use a gluten-free bread if need be. The sweet apple and red onion contrast nicely with the herbal notes. Photos by Hannah Kaminsky. Everyone loves stuffing! The sweet apple and red onion contrast nicely with the herbal notes. Of course, you can use a gluten-free bread if need be. Heat the oil in a large skillet. Add the red onion and sauté over medium heat until golden. Add the apple and sauté for 5 minutes longer or until slightly softened. 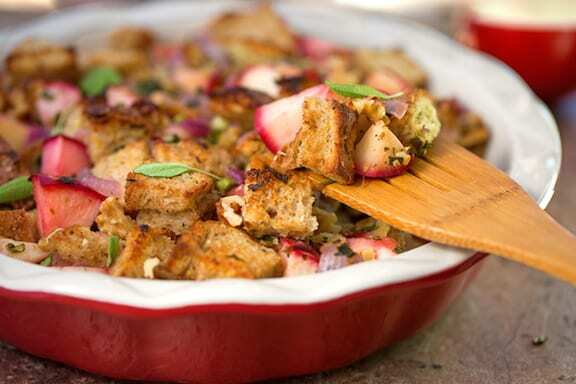 In a mixing bowl, combine the bread cubes with the onion and apple mixture. Add all the remaining ingredients except the broth and salt and pepper, and stir together. Drizzle in the broth slowly, stirring at the same time to moisten the ingredients evenly. Season with salt and pepper. Transfer the mixture to an oiled shallow 1½-quart baking pan. Bake 30 minutes, or until browned and still slightly moist. Stir gently about midway through the baking time. Serve at once. 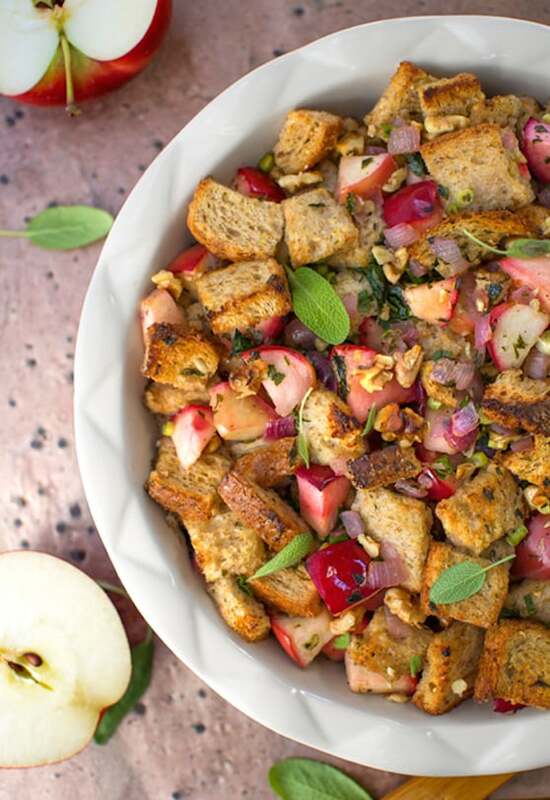 Here are more recipes and menu ideas for A Vegetarian and Vegan Friendly Thanksgiving. A friend made this for a pre-thanksgiving party and, even though I am NOT a stuffing person, I gave it a try. Oh. My. Heavens. I seriously had several helpings and polished it off at the end of the night. 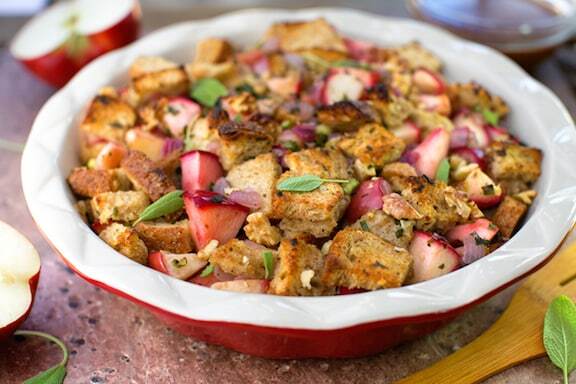 Totally making this for future holiday dinners/potlucks/brunches.